This wide-screen cycling game has a non-PowerPoint element of a stopwatch and countdown timer so you can try to set personal records for your speed in tackling this hill climb. The game works on a similar principle to Red Dot Racer. 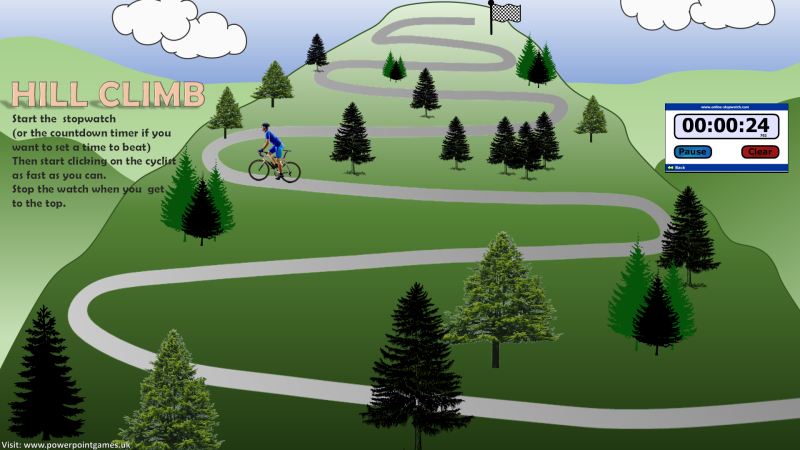 When you click on the cyclist he disappears and then reappears a little way ahead, so you click on him and the process repeats until you reach the top of the hill. You need to start the stopwatch before quickly making your first click on the cyclist, then stop it as soon as you can after crossing the finishing line.